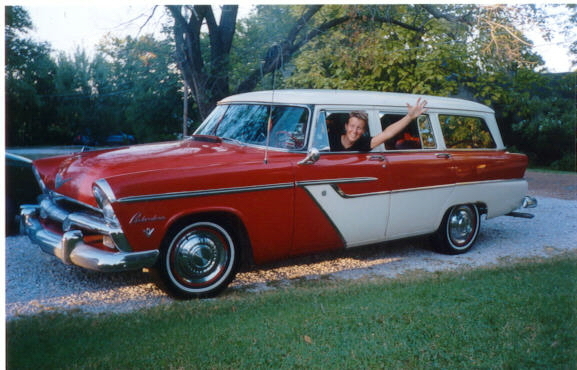 What's a nice girl like me doing with a 1955 Plymouth Belvedere? It was the summer of 2000 and I was on my Annual trip to visit to see friends in Missouri. It was a busy time and I was sneaking in a visit and quick camping trip in the Ozarks. Driving back from my bucolic Ozarkian adventure that included fishing, caving and eating large quantities of meat. Actually the preferred meal for the weekend was Pork, the other white meat, and Beets. Something about the plates of delicious red and white delicacies must have stuck with me. As we were headed back to Columbia I saw this beautiful vehicle on the side of the road. From the highway high above on a bank outside a country funeral home I could see the words "FOR SALE." For the next two days I was obsessed with the car and wanted to return and absorb the details. On the final day of my visit, Charlotte and I headed down Route 63 to take a closer look. Was I crazy? I live in New York City? We called the owner, a wonderful fellow named Karl, and he came down in his aging Caddy. The car was Karl's baby and he had had it for about a decade painstakingly restoring it as a daily delivery driver for his framing business. Karl, said the magic words. "Want to take it for a drive?" I was more than nervous, the car being large and mysterious. But I got in, pressed the gas and felt her power, as she moved down the old access road. The windows were so curved that my vision was distorted out the left and right side and the wheel large devoid of power steering like turning a the rickety control of an old water main. The Belvedere seats nine and has 9/70 AC. That's nine windows at 70 MPH will keep you cool. Karl was asking a fair price and I was obsessed with the fun I could have. But that afternoon I was heading to LA for a business meeting. I couldn't stop thinking about the car. The mass impracticality of owning it and the fleeting possibility that I would be moving to Columbia in the spring to use it. I was still powered by the fantasy of the Internet boom and the idea that in this new economy I had money to burn, or buy a Belvedere. I called Karl a few nights later and said I'd take it. Charlotte delivered the check and one day I will get to drive her. The Belvedere was the top of the line of the 1955 Plymouth "Forward Look" vehicles. The first cars to begin the transformation from eh boxy WW2 era vehicles to the sleek futuristic vehicles of the late 50's. The All New Chrysler Lineup Featured Virgil Exner Styling, And A List Of Modern Engine And Transmission Configurations. These are just some of the reasons that Chrysler Products Enjoyed One Of Their Best Years In Sales And Customer Satisfaction. Forward Look MoPar: A site created to foster discussion among all 1955-1961 Chrysler, DeSoto, Dodge, Fargo, Imperial, and Plymouth owners & enthusiasts all around the world.